For ticket-holding guests, please see below for some useful information. - Festival grounds open at 6 pm with an outdoor opening reception. Enjoy freshly-baked chocolate chip cookies, Jen's Bread, locally-crafted Upinngil cheese, and drinks for a suggested donation. - The concert will begin at 7 pm and end around 8:15 or 8:30. Join us for a post-show bonfire! - This is an outdoor event. You are welcome to bring a small blanket to sit on, or sit on the grass. We also suggest bringing some bug spray. - No need to bring tickets - your name will be on a list. Follow signs to the ticket table upon arrival. - There will be an area of chairs reserved for guests with limited mobility. - Handicapped parking is available - just follow the signs when you get to the top of the hill. - Please get in touch if you would like any assistance walking across the lawn to a chair, and one of us will plan to meet you at your car. 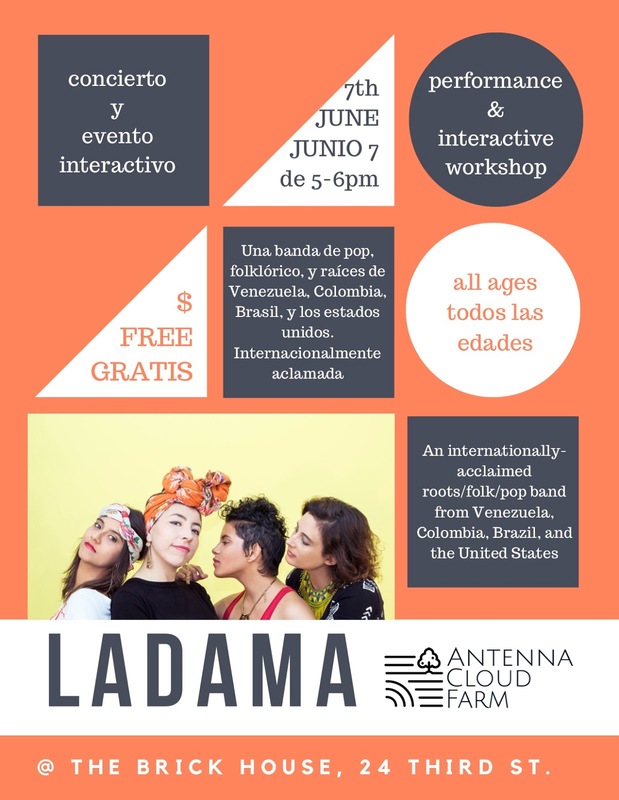 Last but not least, LADAMA will be giving a free interactive workshop/performance TODAY (Thursday, June 7) at the Brick House Community Resource Center in Turners Falls from 5-6 pm, geared towards youth, families, and our Spanish-speaking community. Flyer is attached - spread the word and come on by.